Several methods for decomposing energy consumption or energy-induced gas emissions in industry have been proposed by various analysts. Two commonly encountered problems in the application of these methods are the existence of a residual after decomposition and the handling of the value zero In the data set. To overcome these two problems, we modify the often used Divisia index decomposition method by replacing the arithmetic mean weight function by a logarithmic one. This refined Divisia index method can be shown to give perfect decomposition with no residual. It also gives converging decomposition results when the zero values in the data set are replaced by a sufficiently small number. The properties of the method are highlighted using the data of the Korean industry. EJ - A Note: Will Tomorrow's Energy Efficiency Indices Prove Useful in Economic Studies? 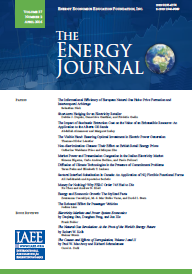 Published in Volume18, Number 3 of The Quarterly Journal of the IAEE's Energy Economics Education Foundation.